So I really haven’t been very awesome keeping the blog up to date this year. There’s been a good deal of the standard reasons behind this happening (requires effort, haven’t set out a scheduled time slot just for bogging …too lazy, too tired, too much to do –you’ve heard them all before); however, there’s also been some pretty legitimate reasons as well—well, okay, one legitimate reason: we’ve updated the Imaginary Wars website–not only that, we’ve incorporated a blog page into the store’s website! This, of course, means I’ll soon be directing this blog’s traffic over towards the www.imaginarywars.com blog page–or at least I’ll be directing what little traffic still drops by (undoubtedly to see if I’ve yet kicked the habit of being lazy) over to the store’s website. And by soon, I mean this week (shock, gasp). So, to wrap up: starting ASAP, this blog will be posting a link to the new blog address (still a WordPress site but one linked directly to the store’s website), and we’ll be moving forward from that point. So what else have I been doing with myself since my last post, back in the middle of June? Work mostly. Work and some holidaying. Holidaying and recovering from holidaying. Recovering and planning for the fall season. Holidaying this year took the form of a camping road trip. 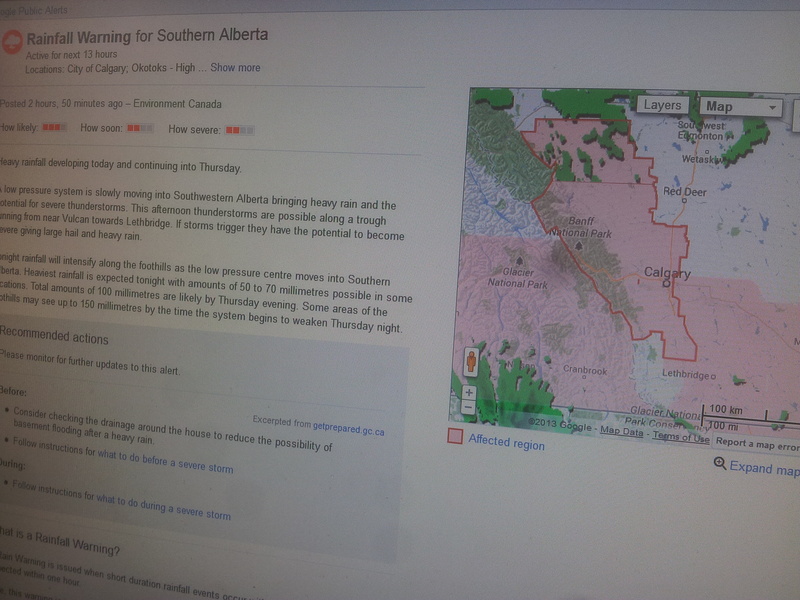 With all of June’s flooding that had crippled Calgary (and indeed much of southern Alberta and all parts mountainous) , we decided to head away from the mountains visible from any higher vantage in the city and explore the eastern edge of the province. The sheer size of the province made an impression on us: we traveled from Calgary, mid-way up the province to a lake that practically straddled the Alberta-Saskatchewan border (a six-hour drive), camped for a few days then drove down to Writing-on-Stone Provincial Park (which ended up being roughly a nine-hour drive) and camped for a few more days. Milk River. Southern Alberta’s Sweetgrass Hills and prairies visible in the distance. Writing-on-Stone campground area, nestled in a small valley between hoodoos and Milk River. A brief rest while exploring all the myriad pathways laced amongst the hoodoos. Other highlights included driving on the Veteran’s Memorial Highway (Hwy36) to the small town of Warner. There’s not much in Warner beyond the gas station, the main street (most its buildings vacant) and the town’s civic building. The civic building is Warner’s main attraction: a dinosaur museum and a settlers museum. 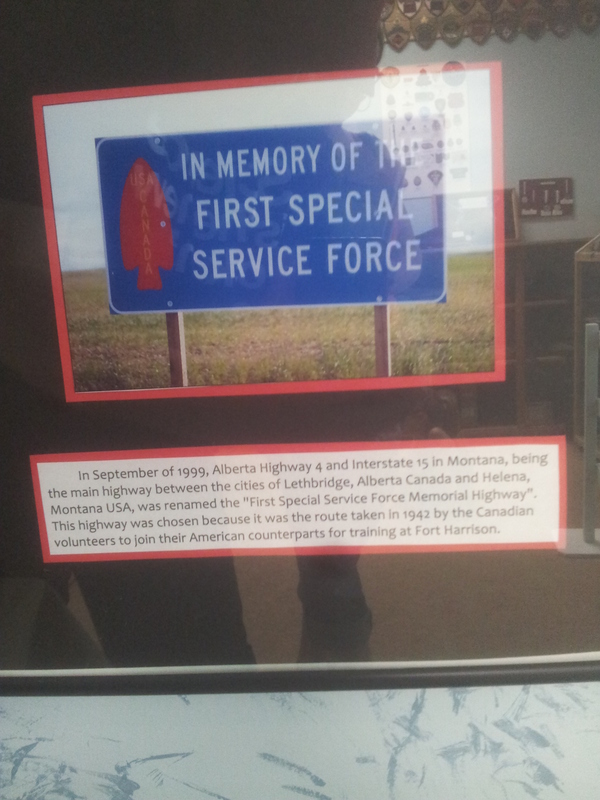 The pride and joy of the museums: the fossilized dinosaur egg (with a nearly complete baby skeleton inside) and the section of the Settler’s museum dedicated to the First Special Services Force–The Devil’s Brigade (Warner sits on the junction of the Highway 36 and Highway 4; Hwy 4 was renamed in 1999 to commemorate it having been the route the Canadians joining 1st FSS used to get to Fort Harrison). Speaking of World War II: my summer activities that didn’t involve traipsing across the province included putting some more work into my mid-war Canadians. 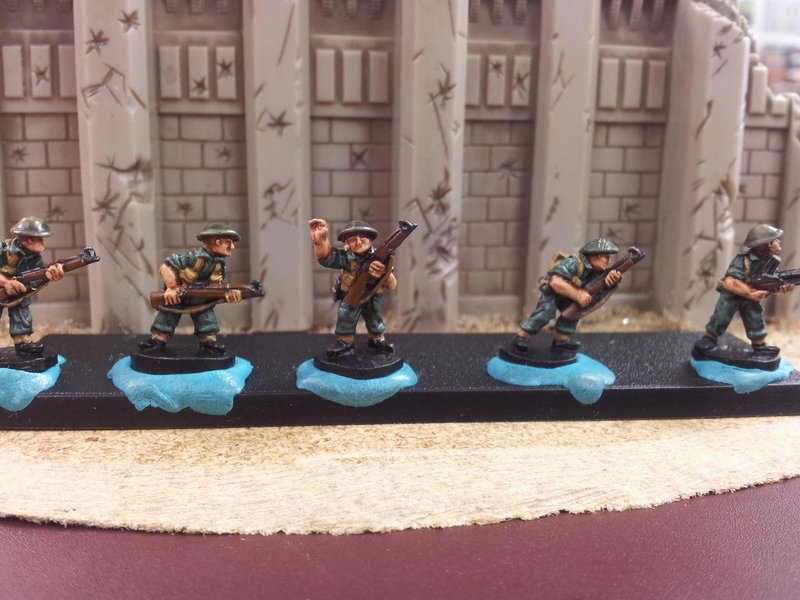 I finished painting up my first platoon and managed to get them on the Battlefront urban rubble bases (they are, after all, in Ortona!) and now I just need to paint those bases. And add snow. No good shots yet exist of the whole platoon in one frame; and even though all the squads are now on rubble bases, no pictures yet exist, so these will have to suffice. Updated photos (hopefully) soon to come! 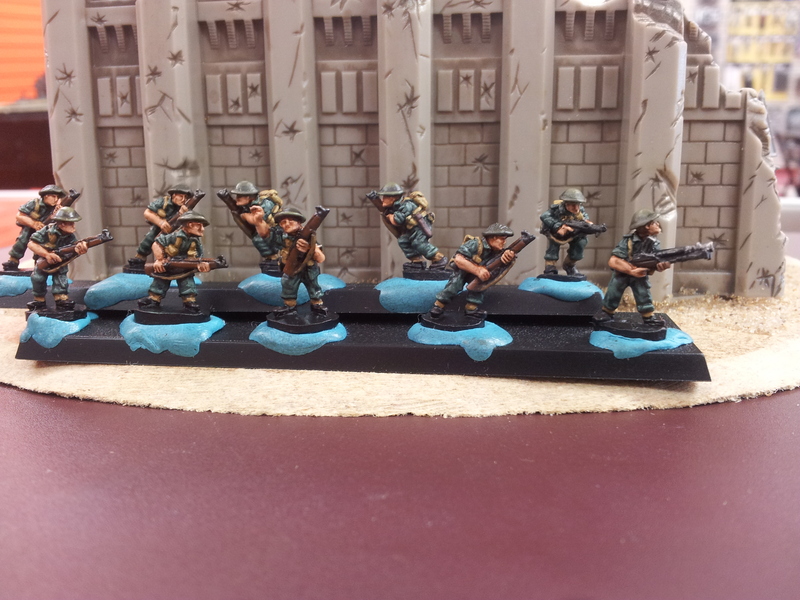 With the first platoon mostly finished, I also started on the second and third infantry platoons (platoon #2 is the photo below). But I’ve ground to a halt and have been derailed by a different Flames of War project. The local Flames of War club decided to do something a little different that got me inspired and motivated: themed gaming. 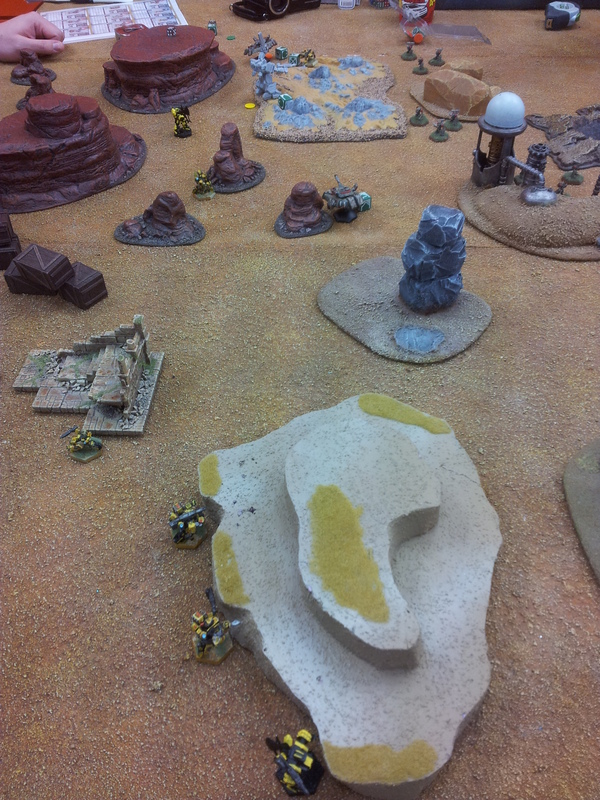 The theme they chose was recon armies using modified Tank/Infantry Aces rules as the backdrop. Armies would be small: no more than 600 points. List structure is intentionally more loose: the 600-point armies must be made up almost entirely of reconnaissance platoons (with up to 150 points of non-recon platoons being allowed). Even better: all games will be played with different missions (which helps overcome the malaise that sets in after a lot of games have been played: when they all start to feel sort of the same). No pictures yet, but I’ve started building a Late-War German Panzerspahkompanie (armoured cars & mechanized scout vehicles). I’ve opted to go the horde route and rather than take a few hard-hitting scout vehicles such as the Panzer II Luchs or the Puma armoured car, I decided to take a lot of lighter reconnaissance vehicles. We’ll see how things go. I’ve also managed to progress more with my Heavy Gear collection. My first cadre is pretty much finished, needing only decals; and I’ve also got my Sagittarius strider to the same spot (though it still needs to be transplanted to its permanent base). 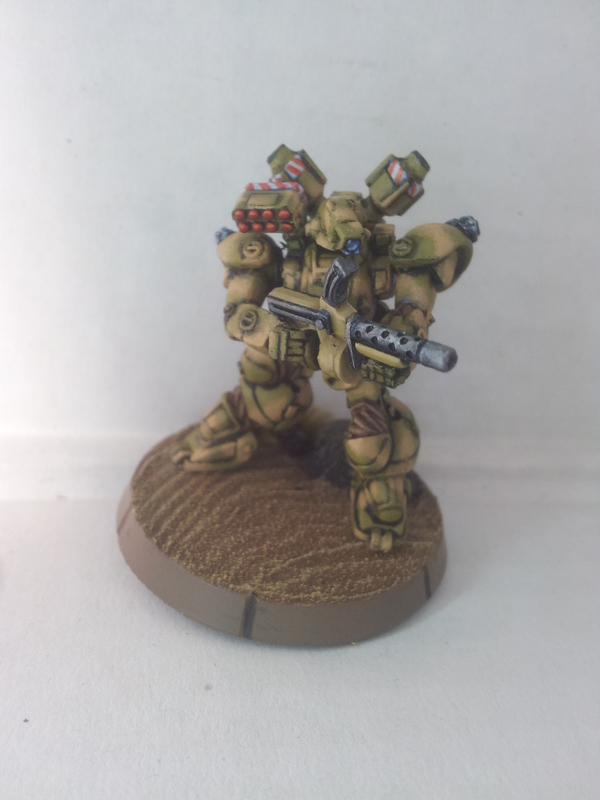 I’ve even managed to hit the half-way mark on the second cadre for my Southern army! Somewhere along the way I managed to stop posting progress shots of my ‘gears, so here’s some progression shots of my first cadre’s Black Mamba and a couple of shots of my Sagittarius strider. Stage 1: Base coat of Vallejo’s Middlestone and Secret Weapon wash (can’t remember the exact concoction of colours in the wash though). Stage 2: base coat cleaned up so only deeper shades and black lining is visible. 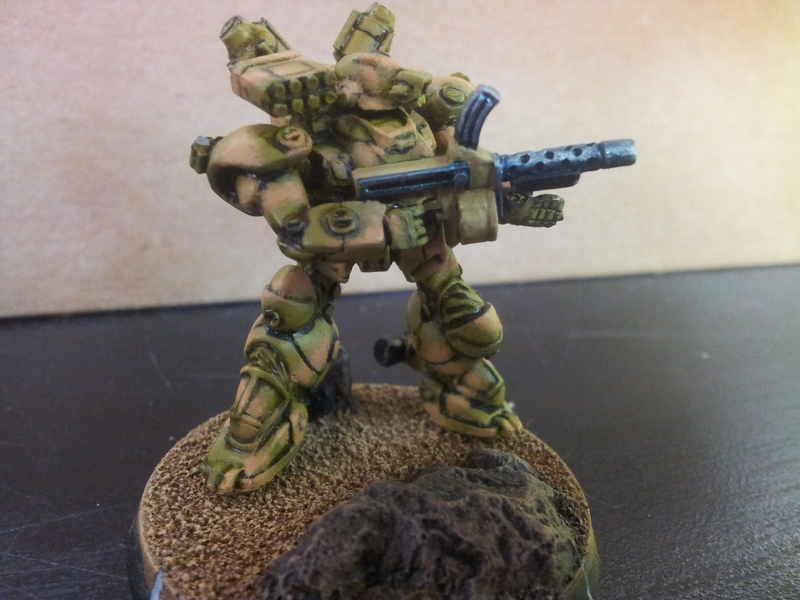 Stage 3: Camouflage pattern stippled on lower leg (after which, I decided to use a sand colour with less green in it). 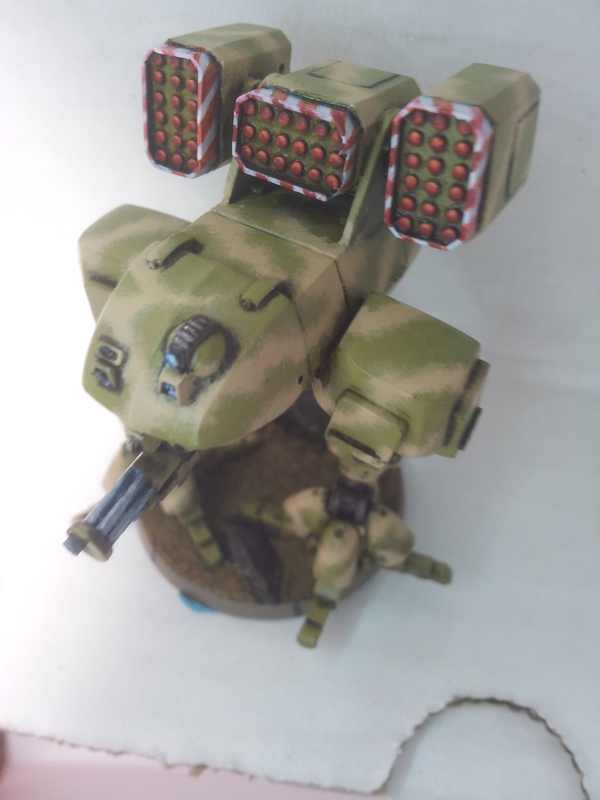 Stage 4: Camouflage complete and gun painted. Base is pretty much done. 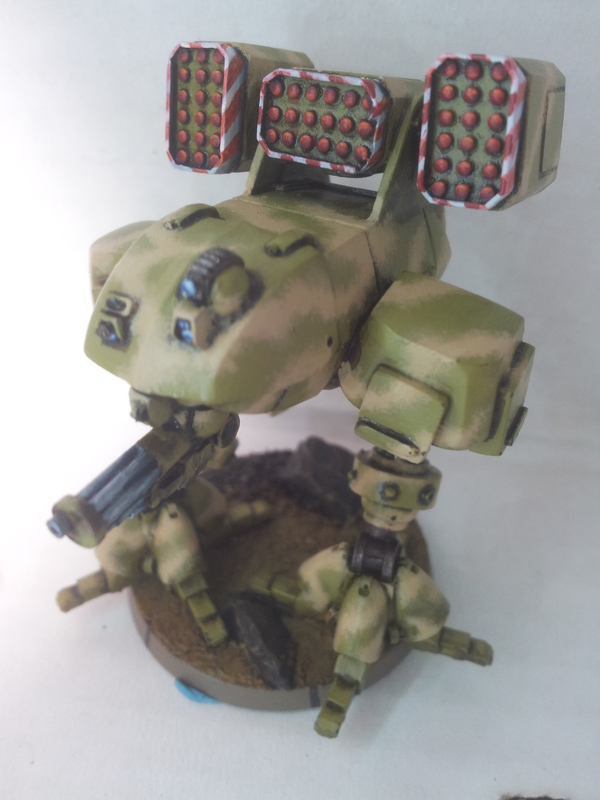 Sagittarius strider at the same point of completion as the Black Mamba. The Sagittarius is spilling over the base it comes with. It will soon be on a 50mm sculpted resin base. I guess it’s not so much that the store has taken over my ability to still have a hobby life. And really, I did, find time to play some Warhammer last week, some Star Trek Attack Wing the week before and the Star Wars: X-Wing game the week before–all while staying caught up with of my “to read” pile of comic books! 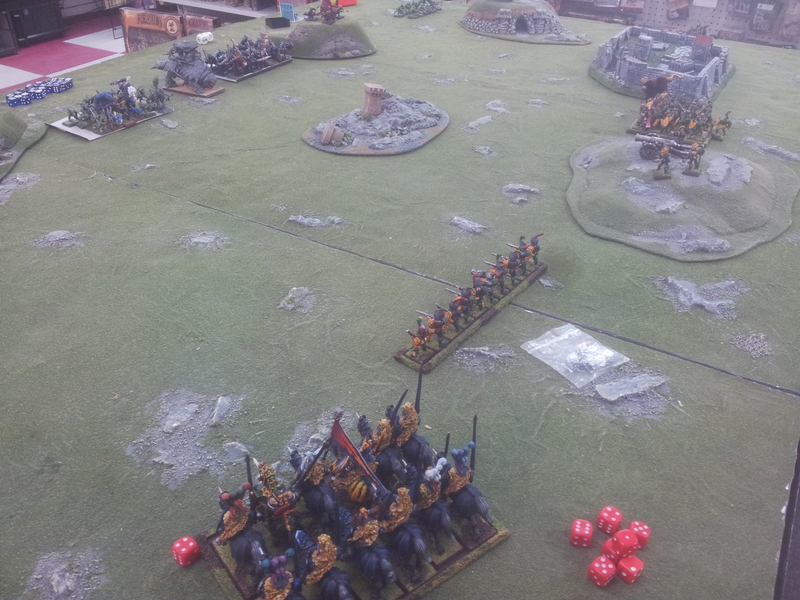 This is my Empire army at 1000 points …just before it got thoroughly pantsed. It’s that I lack the discipline (energy?) to blog regularly about it that’s problematic. Or, hopefully, at least that was the case for the summer. With the store’s website a lot closer to what we want it to be (for now), I’m planning on blogging about the other store-related things that interest me, namely board games and comic books on top of miniatures, leagues and tournaments. I may even be able to get our new guy to write a sporadic blog post about Magic the Gathering. So after our last post, celebrating the store’s first anniversary, I was waylaid by prepping for our participation at the Calgary Comic and Entertainment Expo (which included getting a new website for the store up and running) …and then suddenly time got away from me and here I am updating the blog. So….here we are; it’s time to get back on the blogging horse. But first: a recap of the last two months. The Heavy Gear league wound down, and was generally successful. There were things I was scared were going to happen, and generally they did happen. The points escalation was set so that players’ armies would grow by 300 points every two weeks; there were some on the Dream Pod 9 forums that said such a rate was a bit too ambitious. And they proved out to be mostly right. After resetting the escalation to an easier-to-handle 200 points every three weeks, I was afraid that the league would go on longer than people could commit for (as far as showing up every week for gaming). That fear also proved to be true, and the last few weeks of the league had less participation than the opening weeks. All in all, the league was a huge success, and we grew our Heavy Gear player base by double or more–at the league’s conclusion, I’d say we have a player base of roughly ten committed players plus another five who are on their way to having full armies. Not bad. Not bad at all. April and June saw Games Workshop acting convincingly as though they believed there exists in Warhammer 40,000 more than just Space Marines. 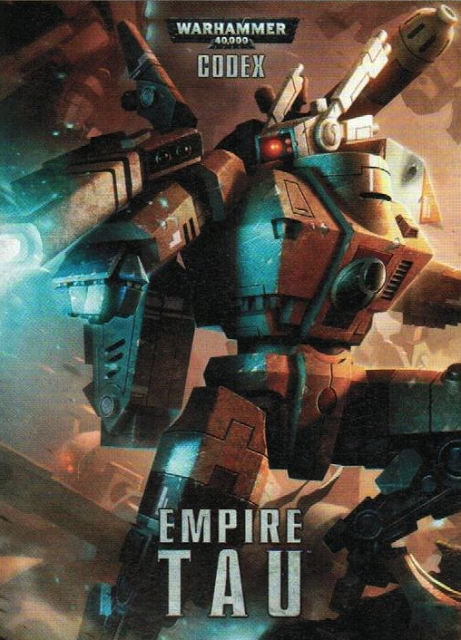 We saw the re-release / revamp of the Tau in April –and were treated to a rather candid display of just how disconnected GW is: they had absolutely NO clue how Tau would be received, as evidenced by their inability to fill more than 40% of their orders for the new models. That’s right: they missed filling SIXTY PERCENT of all their Tau orders. Not only that, but it wasn’t until the first week of June that stores (such as mine) were able to restock any model of their choosing from the Tau range. The arrival of Eldar this June was definitely not the clusterf*ck that the Tau release was. 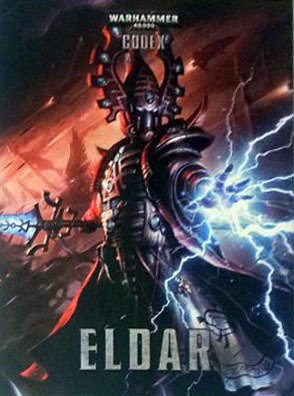 What’s more, unlike the last time Eldar were revamped, this time around the book has actually managed to revitalize and energize the Eldar player base. Funny how not putting out a codex written primarily by the copy and paste buttons on the keyboard will do that. The net result of the Tau and Eldar releases has been a reinvigorated 40k community: six months ago every battle on every table had one (or both) sides comprised of Plague Marines and Aegis Defence Lines; and I’m glad to say that variety has made its appearance once more in the shop. At the extreme eastern galactic border of the Imperium lies the Jericho Reach—which was, long ago, a sector in the Imperium of man. Now, it is no more than a frontier rife with suffering due to the predation of chaos and a multitude of xenos sovereignties. A sudden temporary rift on the warp has gifted a dark corner of this region a small planetoid. 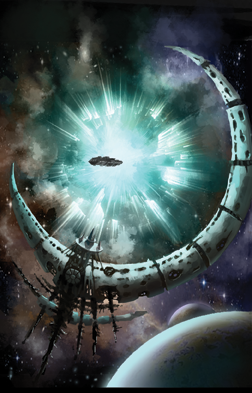 The event would have gone unnoticed had the planetoid (now labeled ‘Anomaly J2512’ ) not begun emitting a powerful psychic beacon upon entering realspace—more than a beacon; it was also a targeted signal, aimed at another system in the Jericho Reach. Army List Due Date: Saturday, June 29. This is not a standard tournament, and my use of the word “tournament” to describe this event is not quite accurate of what we’re aiming to do this coming weekend. The primary goal of this event is NOT the same as most competitive events –that is, to provide players with a controlled environment where they vie to build the best army possible and compete to decide which army performs best under controlled conditions. This event focuses less on being a competitive tournament and more on creating a collaborative opportunity for the participants to help shape an unfolding story. This event requires players to build an 1800-point army list that will represent their army’s expeditionary force dropping down to the planetoid, Anomaly J2512. However, AT NO POINT will the players field all the models in their list in even one of the games. To represent the focus on recon that the armies would have in this situation, the forces players will be playing with in every battle will range from 650 points up to approximately 800 points. The 1800-point army list is essentially a menu of options so that players can modify their armies from one battle to the next and adjust their army to meet the challenges of the next mission. 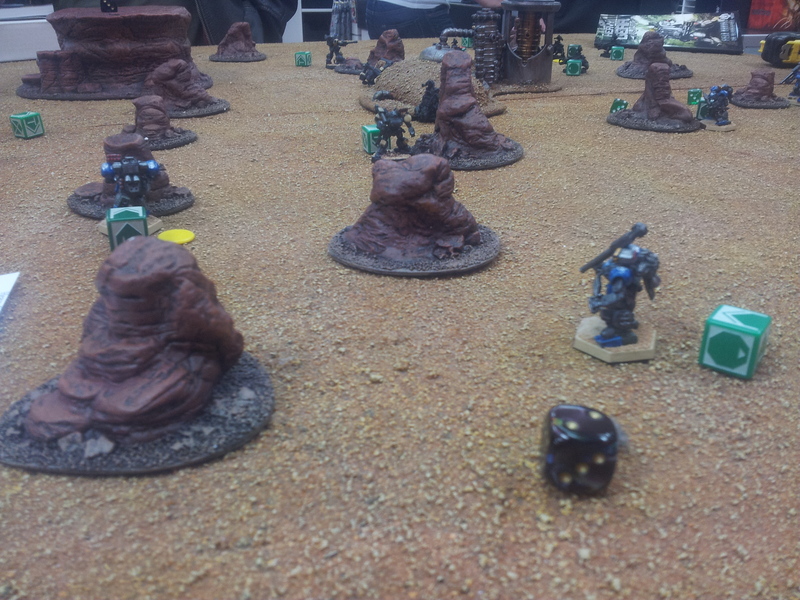 This is an ideal tournament for players who, having played enough games of sixth edition are comfortable with the prospect of gaming outside the relative safety and comfort of the standard missions from the rulebook. Definitely, asking players to change their army list with each battle –and presenting them with scenarios that will demand it– will be asking players to understand their army, rather than simply understanding their army list. I think it’s also appealing to those who are starting a new army, seeing as how battles will be limited to 800 points or less. All the battles during the day will be set at approximately 700-800 points. 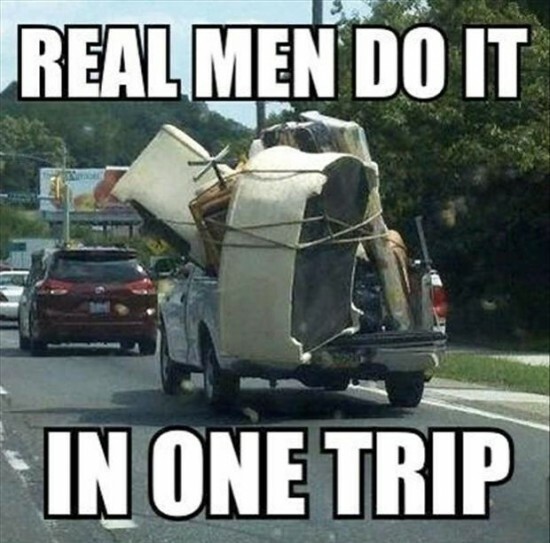 No Unit can be worth more than 225 pts (dedicated transports do not count towards this point total; however the transport as well cannot be worth more than 225 points). 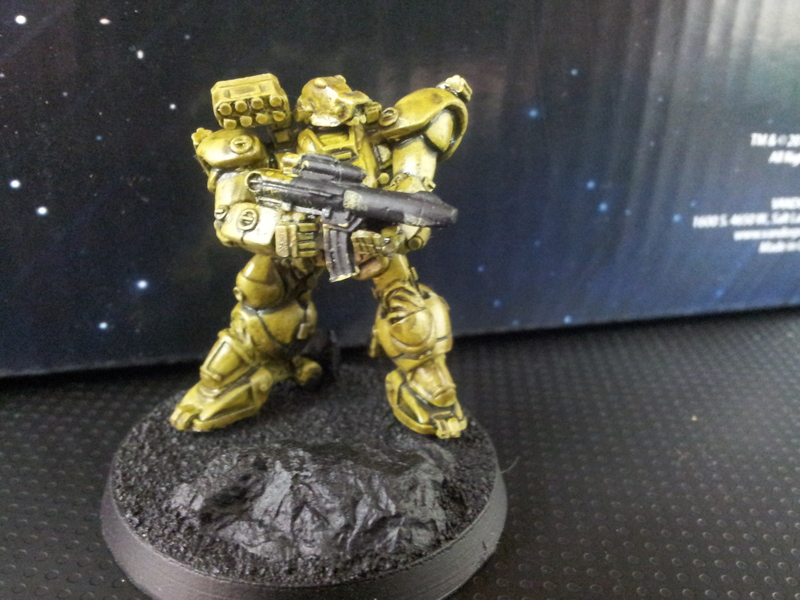 –You can have ONE Expeditionary Force Captain worth no more than 200 points. –You can have up to TWO Lieutenants worth no more than 150 points each. This is an event that celebrates both gaming and the hobby that is intrinsic to the Warhammer 40,000 game. As such, all models MUST be fully painted and on completed bases. If you’re trying to prove your chops with abstract expressionism, this event is the wrong venue for doing so. Go to university for that. Completed bases simply means your models are not on bare, black plastic bases, nor are they on a basic base that has simply been painted over; models based this way cheapens whatever effort has been put into the models and robs from the magic created when two fully painted armies are on a gaming table with painted terrain. All I ask for basing is simple flocked bases –which is actually easier and less time-consuming to do than painting a model’s base. Proxies will NOT be allowed and all models must be What-You-See-Is-What-You-Get. The only exception is on vehicles with secondary weapon upgrades where the upgraded weapon doesn’t come stock with the kit. (Though similar proxies can be reviewed on a case-by-case basis.) Because this is a tournament that allows players to switch their army list from battle to battle, I don’t have much sympathy for players who feel they need to have their models be armed with weapons the miniature isn’t modeled with. I would suggest instead of arguing for a proxies, include another squad (or what not) in your master list that will do the job of the weapon option you want to proxy. 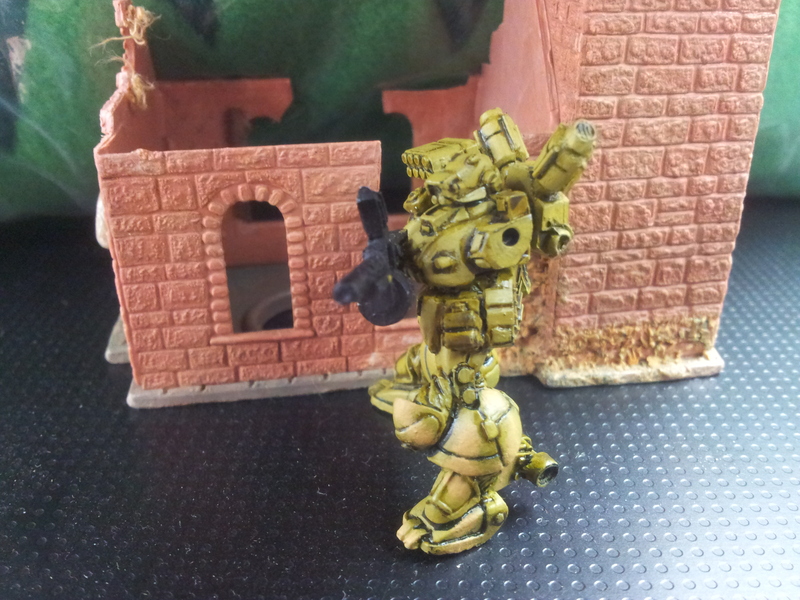 I consider home-built models dangerously close to proxy models. Anyone looking to use custom, built-from-scratch models in the tournament MUST take that up with the Tournament Organiser (IE: me) before the tournament list is due (IE: June 29). Any proxies that aren’t approved beforehand that show up on tournament day risk being counted as casualties before the start of any game they are used in. You have been warned. Why? Because most players put a ton of effort into their armies out of love for the hobby. To go to a hobby-based event without displaying honest effort to a similar degree as the others at the event displays a complete lack of respect for your fellow enthusiasts. Being a game with tons of variables, endless possibilities and myriad ways of understanding (and interpreting) its rules, respect for your opponent is paramount. The other way this tournament is different is that it will be used to kick off the store’s summer campaign for Warhammer 40,000! More info on that will be presented soon. The store’s Heavy Gear league is in full force, and unfortunately one slow week followed by my personal life crowding into (paving over?) 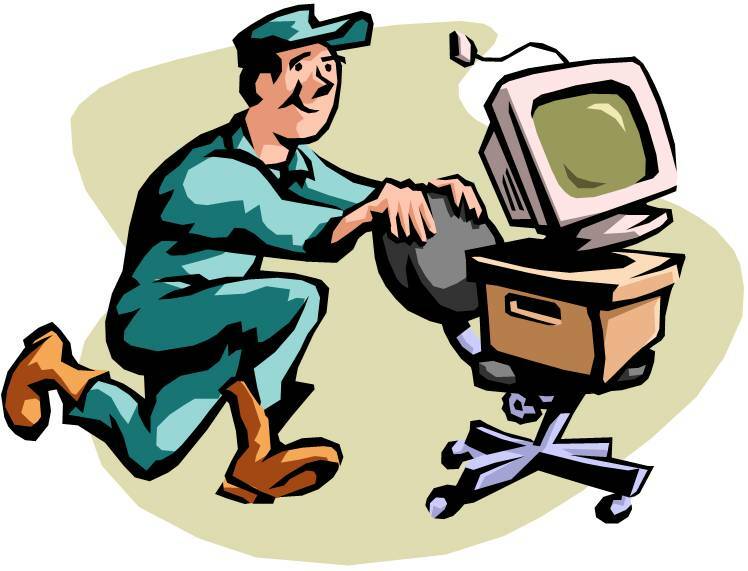 my blogging time has resulted in me not posting a league update for, what–FOUR weeks?? Ugh. Well without further ado, how things are in the league right now –and just in time for this week’s league night! I was only able to pop in momentarily on this evening; and, due to it now being buried in the depths of time, I’m a little unsure of who showed up to play on that league night. I know it was a slower night for Heavy Gear gaming, but I’m pretty sure three or four people showed up and played a couple of games (even though there had been plenty of other miniatures games being played that night–solely of the historic variety: Victory at Sea, Black Powder and Flames of War). Geoff, Bradford, Adam(S) and Curtis were all gaming that night, but I have no clue who squared off against whom; I also seem to recall some Saturday Heavy Gear gaming in this week between Bradford and Curtis. This was the second week in a row that showing up for league night just wasn’t in the books for me. I managed to swing by the store to grab some paperwork; and I did my best to survey the turnout during the five minutes I was in the store. I think the highlight of this week –another slow week for turnout– was that the league had new members! Sean and Justin bought starter army boxes earlier in the week and both showed up this evening. A third person also joined the league, a second Justin (a friend of mine who, like me, almost started playing the game a few years ago but then got distracted by other things and never came back to Heavy Gear). So, while the only established league player showing up on this evening was Adam(S), he had a game against Justin(P) and showed off the mechanics to the other Justin and Sean. The net result of this week was that the league’s roster grew by thirty percent! For the third week in a row, I was unable to do anything more than pop my head in the store–this time almost literally, as I stopped in to grab something before hitting the highway for a weekend excursion to Edmonton (to make use of my free passes to see the Star Wars Identities exhibit …and drink the nights away with old friends!). So, in the few moments I was in the store I checked out attendance for league night; and it was exceptional: we had seven people come out to play! Both Justins showed up as did Geoff, Curtis, Alem and Jimmy. Aric was also at the store with his Caprice force now fully constructed. By the sounds of it, the gaming was really good this week also, which was a fitting end to the 300-points stage of the league. 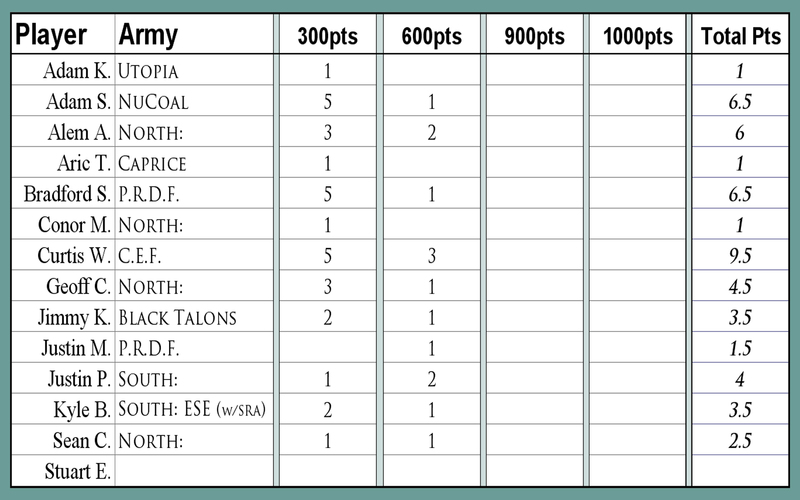 This was the first week of 600-point armies –a week that I think Curtis, Alem and Bradford have all really been looking forward to (they all have more than 600 points fully painted). For me, family movie night with the Avengers meant I didn’t arrive at the store until it was too late to play, but I came nevertheless to see how the night had shaped up. Bradford, Alem, Adam(S), Sean and Curtis had all played games this night. From what I gathered, Curtis played twice that evening: against Bradford and Sean; Alem and Adam also squared off against each other. Because Fridays have been working for league nights so well, and because Saturdays have been a better “standby” Heavy Gear day than Wednesday was, the store changed its March Nightly Gaming schedule and took Heavy Gear off of Wednesday evenings–no need to accidentally have someone drop by on a Wednesday and leave the store thinking that no one plays Heavy GEar …because our community all tends to show up on a different day of the week. Also, whereas it’s pretty easy for four guys to agree to paint 300 points of Heavy Gear every two weeks; it’s an entirely different matter once triple the amount of people are involved. In the last league update post, I made changes to better accommodate everyone’s schedules: I decided that we’d be gaming at each the point level for a little longer than originally planned. I’ve adjusted things again but this time just the points levels for the last two thresholds in the league’s timeline. Instead of the next points limit increasing by 300 points and the one after by only 100 points; we’ve decided that the next two tiers will increase the points limits by 200 points each time. Our goal still remains 1,000 points of painted miniatures by the end of the league. Below is the dates and points level for each period; none of the league’s other basic rules have changed. 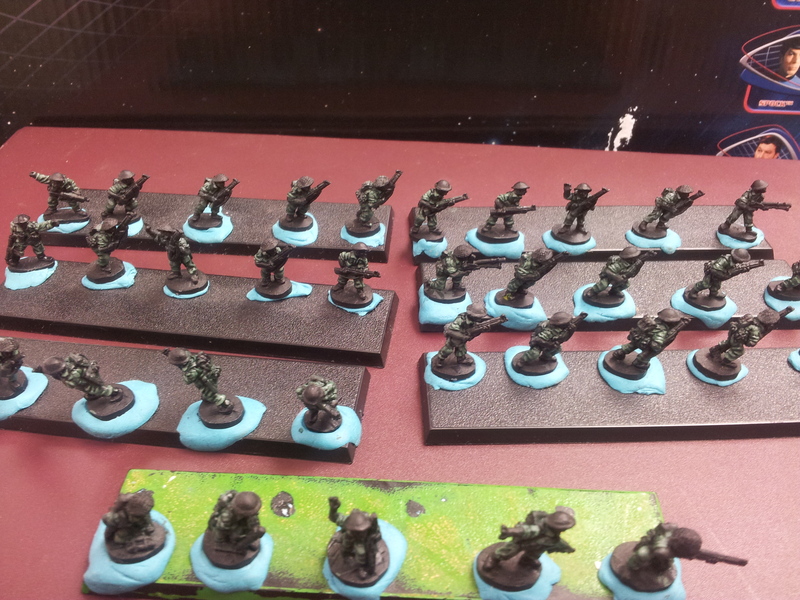 Weeks 4, 5 & 6 – 600 pt. Forces – Runs from Wednesday, March 6th to Sunday, March 24th. Weeks 7, 8 & 9 – 800 pt. Forces – Runs from Wednesday, March 27th to Sunday, April 14th. 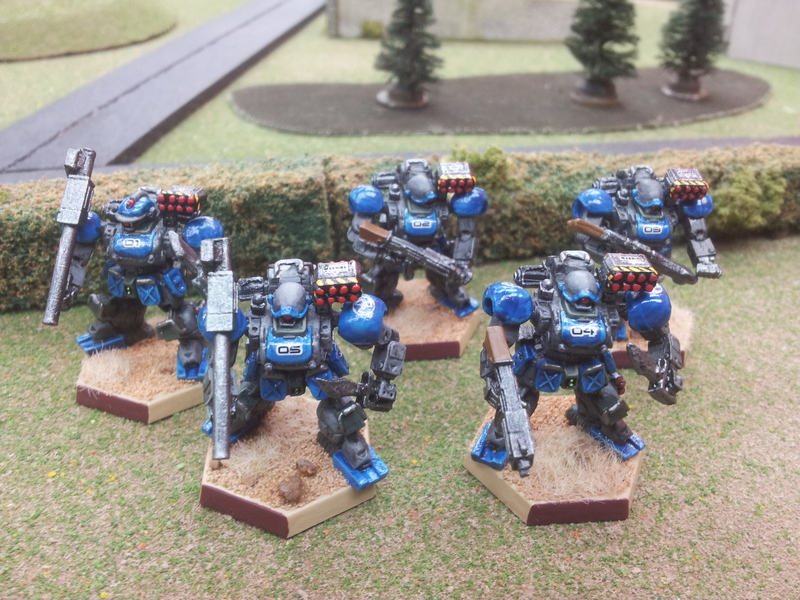 Weeks 10 – 1000 pt. Forces – Runs from Wednesday, April 17th to Sunday, April 28th. C.E.F. (Earth) Flails in a game between Curtis and Bradford. 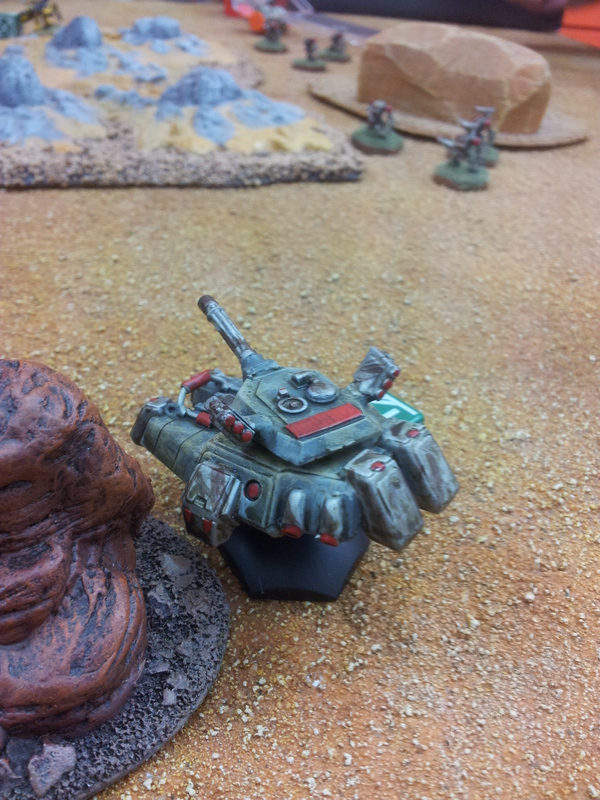 One of Curtis’s (many) C.E.F Hovertanks engaged in battle. 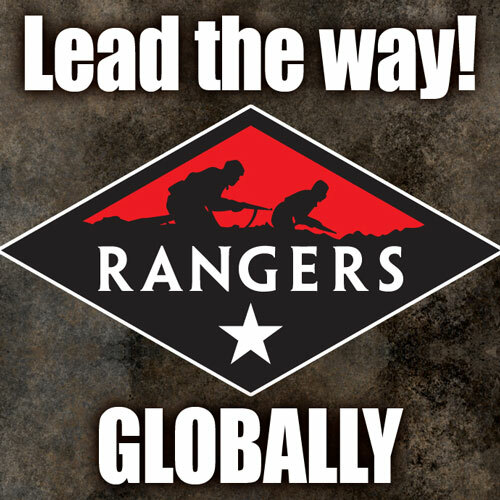 FLAMES OF WAR RANGER DAY: MARCH 30! We’ll be having members from our local Flames of War club, Calgary REGIMENT [link] coming by to show people how to play Flames of War. They’ll be providing everything needed to play a small, fifteen-minute game! This is being done in conjunction with Battlefront miniatures as part of their Rangers program (where they send players to local stores and get them to introduce the game to new people), and I’m really excited to host a day dedicated to introductory gaming with Flames of War. What I also like is that the members of The Calgary REGIMENT club also really pay attention to what makes miniatures games cool: the overall effect you achieve when playing solely with painted models and using scenic gaming boards. 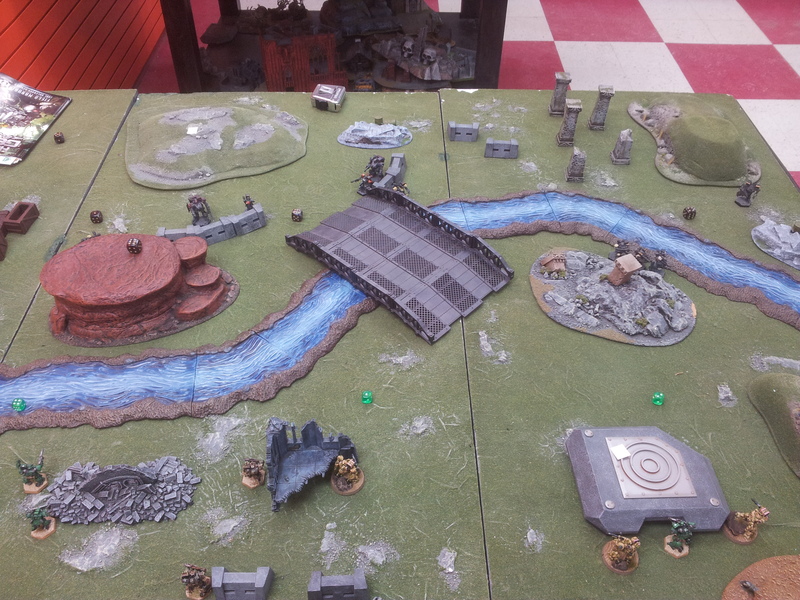 I’ve encountered very few individuals, tournaments –or stores even– that pay attention to the overall look of a miniatures gaming board like this club does. They strive for playable tables that look almost like dioramas depicting World War II European battlefields but use loose, movable terrain so as not to sacrifice re-playability for looks. To get a sense of just how good a job they do, check out the post on their blog detailing the game set up to replay the Carentan battle following the D-Day landings in 1944. What was really cool was that the whole game was inspired by the Band of Brothers episode where Easy Company fought to take Carentan. I’ll be getting into this a bit more in another post (hopefully) in the next few days, but for now suffice it to say that coinciding with the Ranger Day for Flames of War, we’ll also be commemorating the International Table Top Day that was initiated by Wil Wheaton’s Youtube show, Tabletop. However, before I can post more details, I’ll need to take care of some coordinating with the people who have already volunteered to help make the day a success. Until then, for a better idea of what kinds of games we’ll be hosting that day, I’d recommend watching any of the episodes of tabletop on their Youtube channel. If you’ve seen any of their episodes, you’ll already know what kind of board games the show tends to showcase; if you haven’t I’ve included the episode where Wil Wheaton shows off the 2003 Game of the Year winner, Alhambra. Rather than risk boring everyone with my non-stop Heavy Gear updates, I thought I’d take the time to bore people in other ways –namely by highlighting the in-store gaming for this month! Over all my years in hobby retail, I’ve worked at stores that were role-playing games focused, comic-books focused, Warhammer Focused and board-games focused; over all this time, I’ve learned it’s the warm bodies in the store –the ones that aren’t employed there– that makes a store feel like it’s thriving …or at least like it’s not in its death throes. Hence, every games store that isn’t blessed with being a high foot-traffic location tries to have in-store gaming as much as possible just to feel like the place is a busy hub …and also to keep away the oppressive crushing silence that dominates an empty store during business hours. I was first going to give a synopsis of how gaming’s been going and then follow through with a run-down of what games are being played on which days. However, at the starting point of writing that, I realised I being fairly redundant …and then I looked at the games-nights flyer and saw that if I continued on that course I’d be triply redundant. Triple redundancy is a great thing in passenger planes …and the space program. For a blog: not so much. I’ve decided to simply scribe a few thoughts with each day’s gaming (the format of the flyer we hand out and display really limits how much we can say / advertise for each gaming night; some of the gaming days could stand some fleshing out). Infinity has really surprised me: I’m of the view that any game where the one of the first things players say about it is “and you’ll never need more than a dozen models” is a game that is likely living on borrowed time. Infinity sure seems to be bucking that trend! My hobby plate is more than a little full, so I’ve side-stepped this sci-fi skirmish game, but it sure seems to scratch enough itches that the players who buy multiple factions are more the norm than the exception. For an upstart game, our nights are well attended; we do get some slow nights, but we get some quite busy ones too. 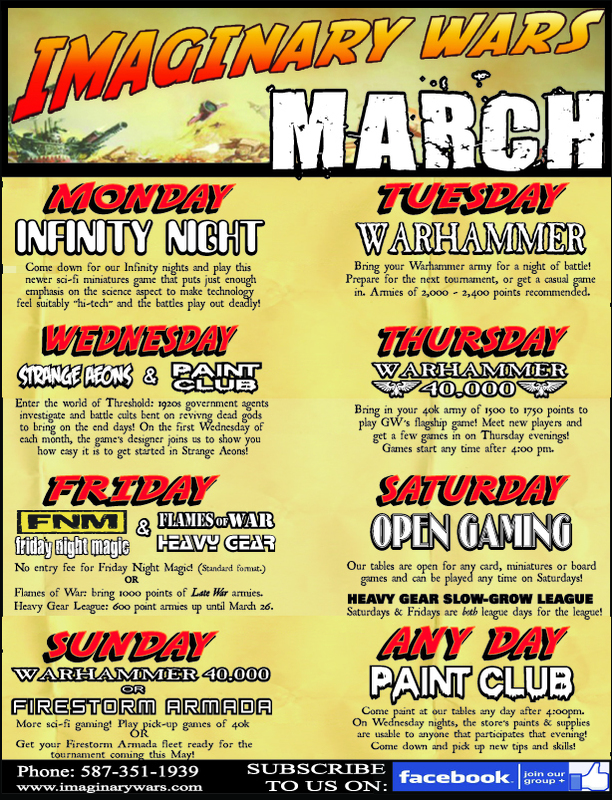 Warhammer nights for us are up and down. That said, we have a few regulars, one of which has been posting battle reports on Youtube regularly (quite a few of them done at Imaginary Wars too!). 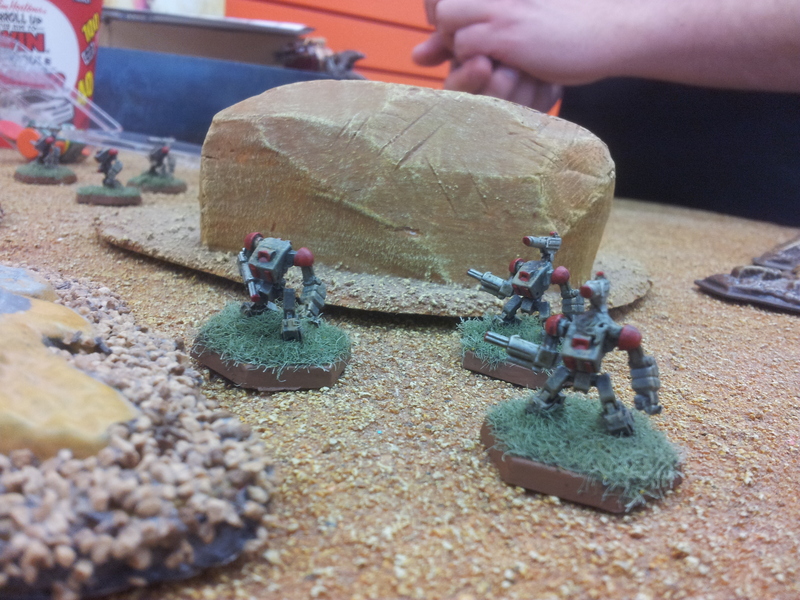 What’s interesting is that on more than a couple of occasions, we’ve some guys (relatively) new to Warhammer 40,000 show up on Tuesday evenings –mainly because their schedules can’t accommodate Thursday or Sunday gaming. Say what you will about Games Workshop, but the pervasiveness of 40k in the gaming world easily rivals Coca-Cola’s in the world abroad. With the Heavy Gear slow-grow league in full force …and being regularly attended on Fridays and (some) Saturdays, I felt having a Heavy Gear night in the middle of the week was risking players showing up to play on several days during the week without ever actually meeting other players. So for now, gaming on Wednesdays will focus specifically on Strange Aeons. As has become tradition, Uncle Mike (the creator of Strange Aeons) shows up at the store on the first Wednesday of each month to run introductory games, show off new rules etc; and though our Wednesdays are attended by a smaller crowd, our Strange Aeons players show up every week …almost religiously. They are one of the store’s most solid groups, and anyone hoping to get into this more casual skirmish game (it’s almost a mash-up of X-Files, Call of Cthulhu and Mordheim) could do no better than to come down to the store on Wednesdays. Once, we had this one disastrously slow Thursday evening (I think there was a blizzard or something to that effect) and only six people showed up to play 40k. Not all nights are crazy-busy, but Thursday is one of the best nights of the week for guaranteeing players an opponent. Eclectic Fridays: More than FNM! Where Thursdays are dominated by 40k, Fridays usually sees double the amount of players engaged in a broad assortment of different games. The tent-pole games are really Magic the Gathering’s Friday Night Magic and Flames of War, but we’ve added Heavy Gear to the repertoire (which is seeing success; I think we have 12 people active in the league right now!). That said, Friday Nights at Imaginary Wars have been no strangers most recently to Victory at Sea and previously Dystopian Wars, Black Powder and Firestorm Armada. 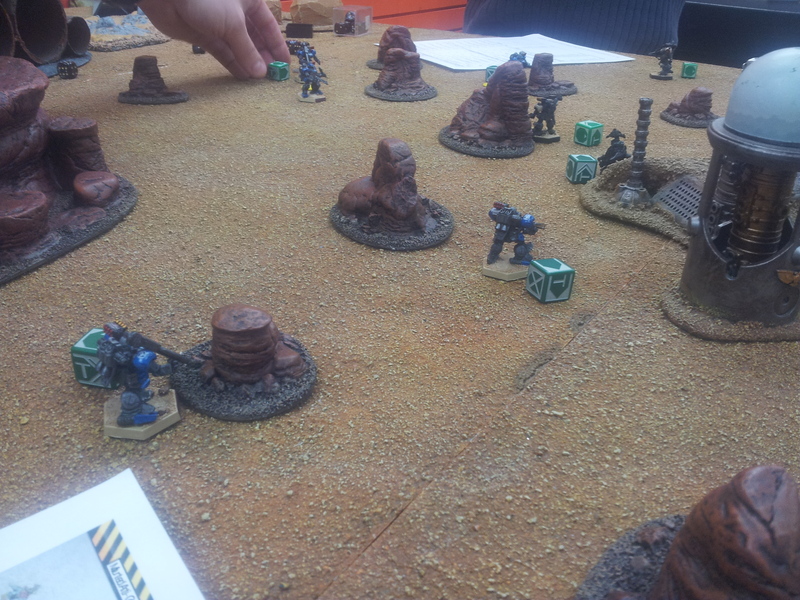 Proving that Warhammer 40,000 is the game ’round these parts, we have it running on Sundays as well –though on Sundays we also tend to see one or more Firestorm Armada games hit the tables as well. For me, Firestorm Armada scratches the itch that GW’s Battlefleet Gothic stopped being able to take care of years ago. Though games regularly take longer than standard 40k games, the rules are elegant enough that players rarely notice the time going by. Easy to learn, difficult to master, great game play and awesome models: all reasons to get into the game! 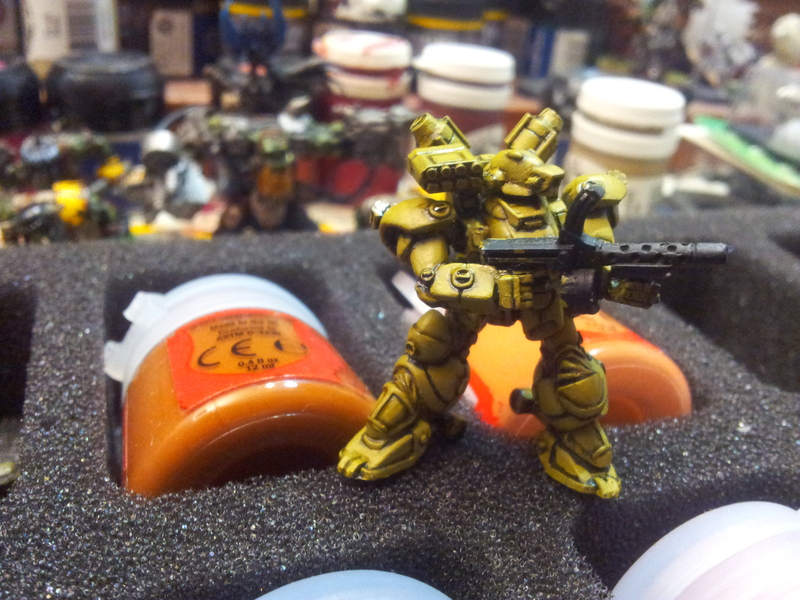 Paint club is our effort to provide space (and supplies) for players to meet up and paint their models. This is all done under the auspice that when people do creative work in concert with others, their productivity flourishes. Sometimes that productivity is evidenced by how much work is done, other times it’s in skills learned or ideas that would never have been struck upon had others not been around to help germinate the initial thoughts and ideas. Anyways, this is what I experienced in university …and (oddly enough) while working at Games Workshop. In fact, ask any ex-Red shirt who worked for GW –back when the Hobby Centres painted store armies– about how their painting improved during their tenure with the company. This is my hope with our painting club night (right now being directed towards Wednesday evenings). that’s what a week of gaming at Imaginary Wars tends to look like. In the coming days, I’m hoping to do an update about our Heavy Gear Slow-Grow League, as well as announce some exciting events on the horizon for the store concerning Flames of War, Firestorm Armada …and possibly Warhammer 40,000 (and maybe Heavy Gear also). 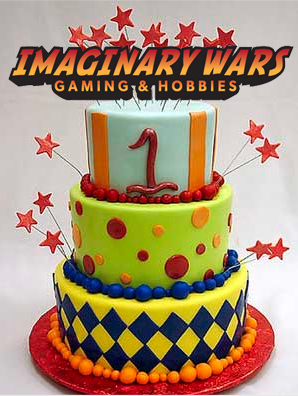 Also, Imaginary Wars Gaming and Hobbies: the store hits its first anniversary next month, and we’re going to do something special for that!